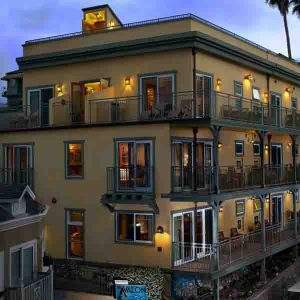 The Avalon Hotel is located at the heart of Catalina Island. Avalon hotel offers top-notch boutique hotel accommodations and luxurious amenities. They offer a touch of class and service in order to make your stay a memorable one. Each room at Avalon Hotel has a unique and special view regardless of the room you choose. From the beautiful ocean, garden, or balcony rooms you will enjoy the ambiance and charm of this boutique hotel. If you are looking for a classic boutique hotel, the Avalon Hotel is the place to be. Avalon hotel provides you with a breathtaking view from the Rooftop deck. From this vantage point, you can see virtually everything overlooking the ocean and harbor. You will also be provided with secluded seats where you can take fresh air as you sip your Champagne. And, don’t forget that Avalon Hotel allows you to bring your favorite drink from outside. This is a special place to watch the sunset and witness first-hand the magical beauty of the water at night. The hotel also features a lovely Garden Patio furnished with beautiful outdoor chairs. Here, you can experience the tranquil ambiance of the elegant fountain. You will also find a fire pit complete with secluded seating surrounded by truly wonderful landscaping. Take a deep breath and relax as you enjoy your piece of paradise. The ocean air refreshes you with every breath you take. At the Avalon Hotel, you can choose between an ocean view, a balcony view or a garden view room, whichever you find most fascinating for you. Each room has a unique and special view regardless of which you choose. 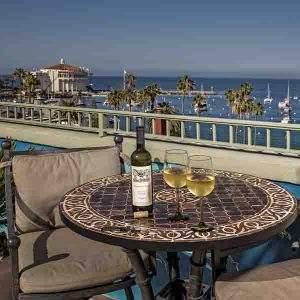 You will certainly enjoy the ambiance and charm of this Catalina Island boutique hotel. 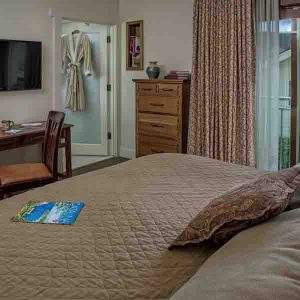 The hotel also offers you a spacious bedroom with a plush king size or queen size bed, a flat screen TV, a microwave and a refrigerator. All the rooms are beautifully furnished with tasteful and attractive designs. And, each room also comes with custom bath amenities of its own kind. Of course, there is free high-speed internet for your convenience. And, you can borrow laptops for use if you so desire. You can be assured that there is a room offering at this hotel which will fulfill your every need. The continental breakfast is available for you between 7.30 am and 10 am. So enjoy a healthy breakfast comprising of fresh orange juice, fresh fruits, muffins, hard boiled eggs, bagel and an organic coffee and a selection of teas just for you. Avalon hotel also offers special afternoon refreshments for its guests. You are also allowed to bring your favorite drink and enjoy it right on the premises. Avalon Hotel is accessible via several different modes of transport. You opt for an hour public ferry ride across the ocean to the hotel. If that doesn’t sound nice to you, a helicopter or a private plane and private boats can do you good where you can be in the hotel within a few minutes. Once you arrive in Avalon, there are shuttles and taxi service through Catalina Transportation Services to help you get around and to the hotel. No matter how you get here, just get here if you can!